I waited so long with this post from last week that it's Wednesday again and not late! And who ever said procrastination was bad? I finished book six and seven of the Anne of Green Gables series and just today started the eighth and final book! I'll be a bit sad when they are done! My kindle version is boring so here is the image from Amazon! I'm continuing to make progress on my Lotus Blossom Tank but I don't have an updated picture. Nearly done with the lace. Now I know the rest of the tank is where the real work of modifications are going to begin. Lots of thinking, though fortunately it will all be stockinette so I may yet finish in a reasonable time. I started a baby hat, it was too big. I decided to make two for siblins but now I'm out of this beautiful, one of a kind yarn. I know I have some great yarn to make matching hats but must dig around in the stash for it! My design attempts continue. I decided I would do this double knit and worked on this some more only to realize a portion of it is just too large! Argh! I'm going to finish this attempt so I have some good measurements and then attempt to gird up the courage to try a fourth time. I don't think I've worked on my O.W.L.S. sweater since early spring! I'm at the point where I'd need to knit sleeves and join them to the body. I have a sneaking suspicion that it's too large and just can't bare the thought of it. I cast on for a size large enough for my chest, but I think it's going to result in the back being too large and thus the lace panel won't be shown to best advantage. I love the yarn, Madelinetosh DK, so I'm undecided if I'm going to finish or frog so it sits forlornly. 1. Why did I think alpaca would make a good cover, especially in humid Hawaii?!? 3. If I did, one full of holes from lace wouldn't be that useful. But it's so rustically beautiful with the undyed natural alpaca, I want to believe I'll go back and finish it. So there you have it! Those are the WIPs I'm willing to admit to! 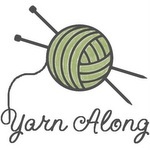 My Sister's Knitter is going to be having a WIPs C/KAL if you'd like to join us! I'm continuing on my China Bayles by Susan Wittig Albert kick. I devoured Love Lies Bleeding - even staying up late for the first time since Wiggle was born - just so I could keep reading. I'm now reading Chile Death. As for on the needles.... I bound off the ABS, so I started some vanilla socks last week. But today I started Basil Bug. I have a delusional belief it will be ready for Wiggle's first Easter! Joining Ginny this week. Feel free to leave a comment with what you're reading and knitting. I have made what is, for me, amazing progress on my sweater. I still have yet to capture the color of this yarn, but maybe I'll try this weekend. My blog feed clued me in to a giveaway (there is still time to enter). It made me nostalgic and yesterday I bought a kindle version since I don't know where the well-thumbed copy from my childhood is. It won't be the same, and some comments suggest this version is an abridged version, but I'm excited about the idea of reading it again. When we got home from Wiggle's NINE MONTH (how is that possible?!) check up today there was still some time to just sit and play. He loves his kitties, including Chip (who he inherited from Dada). I hesitate to show what I'm knitting because it's going to take a long long time and so I feel you'll be bored with it. I've gone back to Douglas Reeman and am reading one of his first books, Send the Gunboat. Just good fictional navy history. A nice, pleasant read. We've been up to so many great things this week, but here is Mister Wiggle at a playground for the first time! He also practiced clapping, which he's getting so good at! First sock is done! I have named this project Brown Trudge. I was going to knit until the yarn was gone but I just couldn't keep going and so I just do the ribbing. I also am very unhappy with the heel and I'm worried it's going to cause a blister. I tore it out once and completely redid it with a different set of directions. And it looked worse than before. :( A better person than me would have tried again but I just plowed ahead because I want to be done. But it really is bugging me. While I try to find another set of directions for the second heel - to try to do it better - I cast on with a very different yarn. Bright, happy yarn! I'm making a toy for Wiggle. I'm completely winging it... absolutely no pattern except in my head. We shall see! Oh, and I haven't started that shawl yet with the yarn I showed last week. Age of Brass and Steam is the blog favorite. But I haven't decided yet. As for reading, I'm reading the second book in the Randall Lee series by Charles Colyott, Pressure Point. I agree with Partner that this second book is better because he's dove right in with the characters. Reading the first book will certainly help to understand the characters better, but it isn't necessary. I really enjoy Colyott's dialogue and internal monologue. It's just FUNNY. It's how my sarcastic internal dialogues go. It's also kind of refreshing and unexpected. In a murder/intrigue novel, usually the dialogue is pretty dark and the the dialogue in the Lee books is just amusing. I also like the accidental sleuth/hero. I'm still recommending the series! Joining Ginny this week. Thought this would be a good way to start of the year of blogging. Normally when I come to visit, my mom will have a pile of books for me to look through. I assumed that was the case with a bag in our room only to discover they were from my sister and meant for the second hand bookstore. Oh well, I found this goofy book - The Least Likely Bride. Only on holiday, would I normally read a full length romance. It's an old one, with all the cliches - pirate, bold girl, love despite all issues. But it's a cotton candy type book and perfect for me this vacation, in 10-20 pages chunks. My goal of a selfish knitting project has been undone by my lack of gauge swatch. Perhaps it's kharma, since I haven't finished my Christmas knitting. I grabbed a quick free pattern on Ravelry to get the stitch count, but liked the pattern so much I followed it. Unfortunately, they are to big around, so now they will be for Partner. Socks on a Plane is the pattern.